Nicknamed the "Sunrise of Java," the bustling port town of Banyuwangi sits on the easternmost edge of the island of Java. Though not a highly touristed area, it boasts a prime location for catching the sun as it rises over Bali. 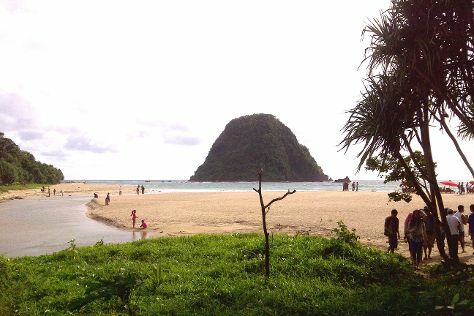 A Banyuwangi holiday offers the chance to spend time in a peaceful, untouched paradise, immersed in the traditions of the Osinic ethnic sub-group--believed to speak the oldest known Javanese language. The scenic mountain range and pristine blue waters may prove particularly enticing for active vacationers. Banyuwangi is in East Java. Plan the details of your Banyuwangi holiday and any onward adventuring with our easy-to-use Indonesia trip itinerary website . A number of accommodations in Banyuwangi cluster in the heart of town as well as close to the nearby national parks. Plenty of clean, basic rooms serve as a budget-friendly jumping-off point for outdoor adventures. In the midrange, good value hotels offer air-conditioning and television. Beware that you will likely encounter touts looking to take you to their preferred destination, and it's up to you whether you want to play along.